The National League of Professional Baseball Clubs, known simply as the National League (NL), is the older of two leagues constituting Major League Baseball (MLB) in the United States and Canada, and the world's oldest current professional team sports league. Founded on February 2, 1876, to replace the National Association of Professional Base Ball Players (NAPBBP) of 1871–1875 (often called simply the "National Association"), the NL is sometimes called the Senior Circuit, in contrast to MLB's other league, the American League, which was founded 25 years later. Both leagues currently have 15 teams. After two years of conflict in a "baseball war" of 1901–1902, the two leagues of 8 team franchises each, agreed in a "peace pact" to recognize each other as "major leagues", draft rules regarding player contracts, prohibiting "raiding", regulating relationships with minor leagues and lower level clubs, and with each establishing a team in the nation's largest metropolis of New York City, and the league champions of 1903 arranged to compete against each other in the new professional baseball championship tournament with the inaugural "World Series" that Fall of 1903, succeeding earlier similar national series in previous decades since the 1880s. After the 1904 champions failed to reach a similar agreement, the two leagues also formalized the new World Series tournament beginning in 1905 as an arrangement between the leagues themselves. National League teams have won 48 of the 114 World Series championships contested from 1903 to 2018. By 1875, the National Association of Professional Base Ball Players (NAPBBP, often referred to as the "National Association"), founded four years earlier, was suffering from a lack of strong authority over clubs, unsupervised scheduling, unstable membership of cities, dominance by one team (the Boston Red Stockings), and an extremely low entry fee ($10) that gave clubs no incentive to abide by league rules when it was inconvenient to them. In 1883, the New York Gothams and Philadelphia Phillies began National League play. Both teams remain in the NL today, the Phillies with their original name and city and the Gothams (later renamed Giants) now in San Francisco since 1958. The NL encountered its first strong rival organization when the American Association began play in 1882. The AA played in cities where the NL did not have teams, offered Sunday games and alcoholic beverages in locales where permitted, and sold cheaper tickets everywhere (25 cents versus the NL's standard 50 cents, a hefty sum for many in 1882). The National League and the American Association participated in a version of the World Series seven times during their ten-year coexistence. These contests were less organized than the modern Series, lasting as few as three games and as many as fifteen, with two Series (1885 and 1890) ending in disputed ties. The NL won four times and the AA only once, in 1886. Starting with the Pittsburgh Pirates in 1887, the National League began to raid the American Association for franchises to replace NL teams that folded. This undercut the stability of the AA. The labor strike of 1890 hastened the downfall of the American Association. After the 1891 season, the AA disbanded and merged with the NL, which became known legally for the next decade as the "National League and American Association". The teams now known as the Cincinnati Reds, Los Angeles Dodgers (originally Brooklyn) and Pittsburgh Pirates (as well as the now-defunct Cleveland Spiders) had already switched from the AA to the NL prior to 1892. With the merger, the NL absorbed the St. Louis Browns (now known as the St. Louis Cardinals), along with three other teams that did not survive into the 20th century (for those three teams, see Partnership with the American League below). While four teams that moved from the AA remain in the NL today (Pittsburgh , Cincinnati , Los Angeles [originally Brooklyn; 1890], and St. Louis ), only two original NL franchises (1876) remain in the league: the Chicago Cubs and the Atlanta Braves (originally in Boston, and later Milwaukee). The Cubs are the only charter member to play continuously in the same city. The other two pre-1892 teams still in the league are the Philadelphia Phillies and the San Francisco Giants (originally New York), both of which joined in 1883. After eight seasons as a 12-team league, the NL contracted back to eight teams for the 1900 season, eliminating its teams in Baltimore, Cleveland, Louisville (which has never had another major league team since), and Washington. This provided an opportunity for competition. Three of those cities received franchises in the newly christened American League (AL) when the minor Western League changed its name to the AL in 1900, with the approval of the NL, which regarded the AL as a lesser league since they were a party to the National Agreement. The AL declined to renew its National Agreement membership when it expired the next year, and on January 28, 1901, the AL officially declared itself a second major league in competition with the NL. By 1903, the upstart AL had placed new teams in the National League cities of Boston, Chicago, New York, Philadelphia, and St. Louis. Only the Cincinnati Reds and Pittsburgh Pirates had no AL team in their markets. The AL among other things enforced a strict conduct policy among its players. Through the 2018 season, the Dodgers and Giants have won the most NL pennants, with 23 each. Representing the National League against the American, the Cardinals have won the most World Series (11) followed by the Giants (8), Dodgers (6), Pirates (5), and Reds (5). St. Louis also holds the distinction of being the only AA club to defeat an NL club in the 19th-century version of the World Series, having done so against their now-division rival Cubs. Philadelphia Phillies, enfranchised 1883 as the Quakers and adopted the Phillies name officially in 1884. From 1943 through 1948, the Phillies unofficially changed their name to the "Philadelphia Blue Jays". Although their jerseys retained the name "Phillies", they wore a blue-jay patch on their sleeve. The team is the oldest continuous, one-name, one-city franchise in American professional sports history. ^ Jensen, Mike (October 16, 2008). "'Fantastic feeling' for Bill Giles". Philadelphia Inquirer. Retrieved May 7, 2017. ^ "The Almanac – weekly". January 27, 2009. Archived from the original on June 7, 2011. Retrieved February 10, 2009. ^ Koppett, Leonard (2004). Koppett's Concise History of Major League Baseball. New York: Carroll & Graf Publishers. p. 141. ISBN 9780786712861. ^ For more details, see Milwaukee Brewers#1994–98: Realignment / "We're taking this thing National". ^ Mayo, David (May 22, 2011). "Detroit Tigers manager Jim Leyland compares managing in AL and NL". Mlive.com. Retrieved April 1, 2017. 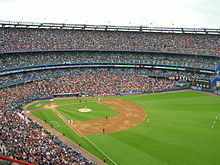 ^ For more details, see Houston Astros#2012–present: Jim Crane era and move to the American League. ^ Dewey, Donald & Acocella, Nicholas. The Ball Clubs, p. 28. HarperPerennial, 1996. ISBN 0-06-273403-2. ^ United Press. "Once Pirates Were Called Innocents!". The Pittsburgh Press, April 21, 1943, p. 31. Retrieved on May 15, 2013. ^ Shaughnessy, Dan. "This Series is fantasy baseball". Sun Journal (Lewiston), October 20, 1999, p. C1. Retrieved on May 15, 2013. ^ "History: Phillies Timeline (1800s)". Philadelphia Phillies. Retrieved July 11, 2010. This page was last edited on 23 April 2019, at 04:51 (UTC).